In the early Church, Lent was the process developed to welcome new members. As they prepared themselves, a season before Easter evolved of renewal for the already baptized and confirmed. This is what we now call Lent, from the Latin for springtime: new or renewed life. Lent is about believing in the possibility of love, of God’s dream of reconciliation, of restoration, of people living together with all creatures and creation, in love. And yes, Lent is about what we can and must do to allow the Spirit to pierce our hearts with the arrow of God’s fiery, passionate love. We don’t mark one another with ashes to be morose about our sinfulness and mortality or to defy the Gospel warning against performing religious acts just to be noticed. 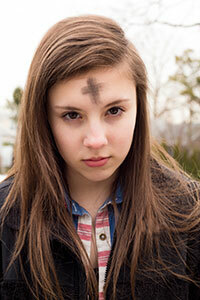 Rather, a smudgy cross mark reminds us God’s love is for real: we come from God and are destined for Him. The cross is a sign seared into our souls that can never be eradicated! We pray, fast, and give generously to signal our conviction that we live together in the power of Christ’s resurrection victory of love. That’s the joy and the hope that infuse this entire season of Lent!